The Sierra Nevada - including Mount Whitney, the tallest mountain in the lower 48 at 14,505 feet (4,421 meters) - dominate the eastern part of the state. The mountain range rises above the surreal playas and salt flats of Death Valley, the hottest place in North America, and the arches of the Alabama Hills to the east. Giant Sequoia trees grow at the western foothill of these peaks and are the world’s largest single trees. Yosemite, Kings Canyon, and Sequoia National Parks protect vast areas of alpine wilderness. Further south, the badlands and Joshua trees of the Mojave Desert stretch for miles across the arid land and surround the eerie Salton Sea. America’s most surreal desert park, Death Valley can also claim the record for hottest temperature ever recorded (134 °F or 56.7 °C) and the lowest point in North America (282 feet [86 m] below sea level) at Badwater Basin. During the winter rains, the Basin temporarily floods. After the water evaporates, it leaves behind high concentrations of salt arranged in beautiful crust of hexagonal shapes (picture one). In the distance the snow-capped Telescope Peak and the Panamint Range rise to 11,049 feet (3,368 meters). Nearby Cottonball Basin (picture two) and Devil’s Golf Course (picture three) provide other extraordinary example of how water evaporation and salt combine to alter the land in bizarre fashion. 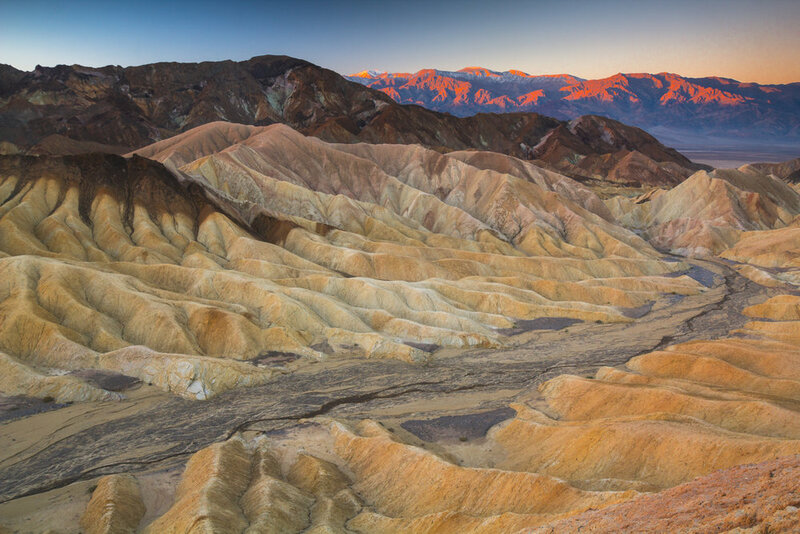 In addition to the salt flats, Death Valley is home to a number of multicolored badlands, the most famous being Zabriskie Point (picture five). This erosive, undulating landscape of gullies and mud hills at the edge of the Black Mountains, leads to the white salt flats in the main valley and mountains beyond. It is one of Death Valley’s most iconic locations along with the Racetrack Playa (picture six), a scenic dry lake filled with polygon-shaped mud cracks. The Racetrack is most famous for its mysterious “sailing stones,” rocks found on the playa floor with long trails behind them. When the Playa freezes in the winter, the ice pushes these rocks across the playa, cutting a furrow in the sediment as they move and inscribing linear "racetrack" imprints. The great Mojave is the driest desert in North America and its boundaries are generally noted by the presence of Joshua trees. It’s most famous park, Joshua Tree National Park, as well as the neighboring Mojave National Preserve, contain great concentrations of these alien-looking specimens (picture one). Despite being a desert park, Joshua Tree is also home to diverse plant species, most notably the spiky yucca plant (picture two) and prickly cholla cactus (picture three). Bordering the desert in the north, are the strange Trona Pinnacles (picture four) an unusual geological feature of tufa spires surrounded by many square miles of flat, dried mud and with stark mountain ranges at either side. Redwood National and State Parks are a complex of several old-growth forest parks located along the far northern California coast. They comprise Redwood National Park, and California's Jedediah Smith Redwoods, Del Norte Coast Redwoods, and Prairie Creek Redwoods State Parks, which together protect 45% of all remaining coast redwood. Because they are so far north, these four parks receive more rainfall and morning fog than other redwood parks further south near San Francisco, allowing the trees to reach maximum height and circumference. The redwoods here are the tallest, and among the oldest and largest in the world. The jungle environment of Jedediah Smith Redwoods State Park, in particular, produces several record-setting tree sizes, including the great Grove of Titans (picture one) and Stout Grove (picture two). Several giants exist further south, in Humboldt Redwoods State Park, even ones that have toppled over and exposed their massive undersides, like the trees of Saddler Grove (picture six). One of those is the magnificent fallen Dyerville Giant. The giant redwood once stood 362 feet tall and was considered the tallest tree in the park before its collapse in 1991. The redwood’s crash to the ground shook the earth so much that it registered on a nearby seismograph and one local, who heard the impact from half a mile away, thought a train had crashed. The Salton Sea is a shallow, highly salinated lake accidentally created when an effort to redirect the Colorado River to increase water for farms led to massive flooding. The lake has been slowly evaporating and the fish and trees that once grew here are slowly dying (picture two). Anza-Borrego Desert State Park is a massive, sprawling park of arid mountains (picture one), slot canyon, and badlands, like the Font’s Point overlook (picture three). If enough rain has fallen in the previous winter, the park explodes in color during the annual desert bloom of wildflowers.